There’s no denying that ankle boots are a wardrobe essential for women. Practical, comfortable, and stylish, these awesome boots are perfect on so many levels. Not only are they ideal for almost any time of the year, but they can also suit a range of outfits and can easily be dressed up or down. So, if you’re not utilising your ankle boots to their full potential, it’s time to experience just how versatile these shoes can be. Luckily, we have plenty of inspiration for how to wear ankle boots. From casual denim outfits to sophisticated office attire, these stylish ensembles will ensure these shoes are your favourite footwear option of the year. One of the best things about ankle boots is that they’re seriously versatile. Thanks to their flattering style and practical length, these stylish shoes can suit many looks. Whether you’re wearing jeans, pants, a skirt, dress or jumpsuit, ankle boots can provide an excellent footwear option. As such, you shouldn’t be afraid to experiment with your outfit when rocking these boots. Even something as unexpected as sweatpants can look surprisingly stylish with ankle boots. While it isn’t hard to dress ankle boots up for an evening out, these shoes are perfect for casual ensembles, particularly in autumn and winter. Whether you want to rock your boots on the weekend, an evening out or even to work, we have a stylish look for you. Just remember to pay attention to the style and height of your shoes to achieve the perfect look. Due to their popularity, there are countless ankle boots on the market, and each will add something different to your outfit. So, if you’re aiming for an ensemble that’s chic and elegant, a stiletto boot may be best. Alternatively, if you’re after a relaxed aesthetic, a flat boot may be the ideal option. Ankle boots and jeans are a match made in heaven. Both are classic and casual while also being stylish and edgy. As such, the combination is one that always looks good and is perfect for relaxed occasions. Due to their slim silhouette, most ankle boots are best complemented by skinny or tight-fitting jeans. A pair of slim jeans, a button-up shirt, and a blazer makes a chic outfit option that’ll pair excellently with ankle boots. Just be mindful of the length of your jeans. Opting for a cropped design or cuffing your pants at the bottom will show off your boots best and provide a balanced appearance. When it comes to wardrobe classics like ankle boots, we can all be guilty of falling into a rut with our outfits. 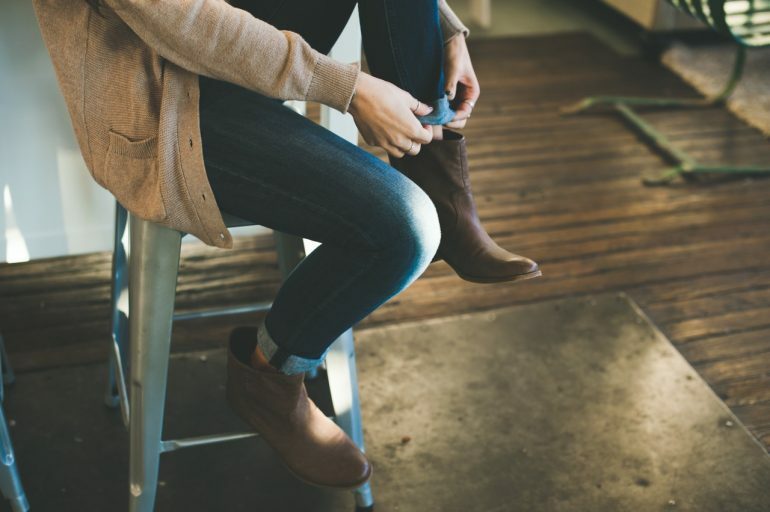 After pairing your trusty booties with jeans time and time again, it can be hard to imagine what else to wear them with. Don’t be afraid to try something different. Rocking your ankle boots with a dress or skirt can make a fantastic option that’s ideal for sophisticated day looks and casual evenings out. To nail the look, try opting for a midi length. Doing so will give you a stylish flash of skin between your boots and hemline that will balance your outfit. You will also appear seriously on-trend for 2017. While heeled ankle boots are ideal for giving casual outfits a lift, flat boots are perfect for projecting a relaxed aesthetic. To rock these shoes in 2017, just remember to make the look a little edgy. Doing so will prevent these simple boots from appearing plain or boring. You can even select a pair with buckles or studs to make them more fashionable and bold. As flat ankle boots are less flattering than those with heels, remember to partner them with bottoms that are slim. Black skinny jeans make an excellent option and will also help to achieve an edgy and stylish appearance. Rock heeled ankle boots to give casual outfits a lift. Choose flat ankle boots for a relaxed or edgy aesthetic. Make ankle boots and jeans your go-to combination for a chic weekend look. Don’t be afraid to partner your ankle boots with a dress or skirt for a sophisticated daytime outfit or casual evening ensemble.